A fun new recreational fad has invaded the Russian capital. Quests – квесты (kvesty) – are life-sized puzzles which challenge you to get out of a room in less than an hour by solving a series of puzzles – загадки (zagadki) and logical problems. Each quest has a backstory, and immerses you in a particular universe. The first to be installed in Moscow took the theme which probably is the most familiar to Russians, that of the Soviet apartment – совесткая квартира (sovestkaya kvartira). Once you push the door open, you will find yourself in the interior of a typical Soviet apartment, 50 years in the past. You will find only a replica here, but for many Russians, this is the norm. 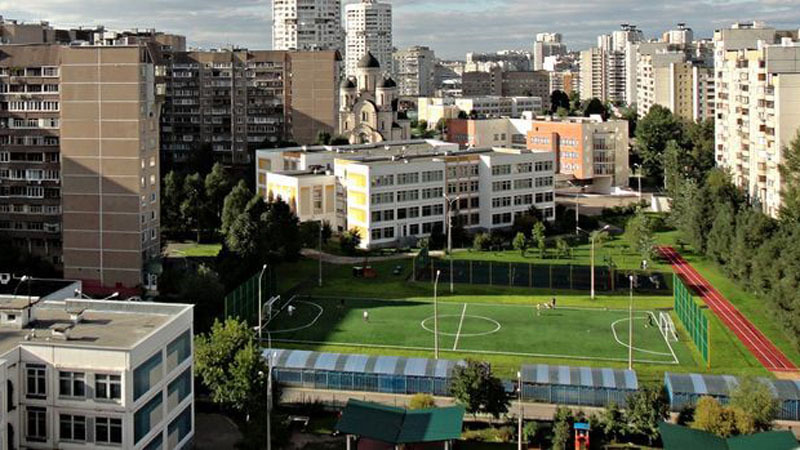 And even if the communal apartment – коммуналка (kommunalka) is a distant memory and the current trend is renovating apartments in an “European” style – евроремонт (Yevroremont), for many, the Soviet apartment remains a reality. To find an example of a typical Soviet-era apartment, do not waste your time looking in the skyscrapers – небосркёб (neboskrob) of Moscow-City, but rather explore one of the buildings that were the symbols of urbanism built during the Khrushchev and Brezhnev periods. Nikita Sergeyevich even gave a name to this type of building, commonly called a хрущевка – khrushchevka. These buildings are similar in that they are five to ten stories tall, made of brick, and constructed without embellishments or artifices. These buildings are the perfect setting for our Soviet apartment. Imagine an entrance – подъезд (pod’yezd) and rows of mailboxes – почтовые ящики (pochtovyye yashchiki). We take the elevator which stops between floors. We pass the garbage chute – мусоропровод (musoroprovod), and then we are already on the landing – площадка (ploshchadka), in front of the heavy door. Crossing the threshold, we take off our shoes and put on slippers – тапочки (tapochki). Inside, time seems to have stopped somewhere in the 70’s – семидесятые годы (semidesyatyye gody). Floral wallpapers – цветочные обои (tsvetochnyye oboi), adorn the walls and are different in each room, giving the apartment the feeling of a faded botanical garden. The living room – гостиная (gostinaya) is the largest room in the apartment. A piece of “wall furniture” – стенка (stenka) occupies an entire side of a wall. There is a subtle combination of wardrobes – гардероб (garderob), cupboards – шкаф (shkaf), and other cabinets – сервант (servant). We discover a mismatched collection of dishes – посуда (posuda) and porcelain figurines – фарфор (farfor), a series of small vodka glasses – рюмки (ryumki), as well as books of most of the Russian classics and old editions of foreign literature (always with a Russian translation of a Shakespear – Шекспир, a Dickens- Диккенс, or a Galsworthy – Голсуорси), albums with faded photos, and all types of indefinable bric-a-brac. On one of the walls, you will see a carpet – ковер (kover) with colorful motifs, whose unusual location of being hung on the wall, does not lend itself to its intended use. The Soviet apartment is a paradise of patterns, and the curtains – шторы (shtory) are, of course, no exception. The balcony – балкон (balkon) can serve as a storage area or as a winter garden when it is covered. The general plan of the apartment can be confusing, and a huge living room can adjoin a narrow bedroom – спальня (spal ‘nya), where the bed is too big for one person, but too small for two. Similarly, we often find the fridge – холодильник (kholodil‘nik) in the entrance, or a washing machine – стиральная машина (stiral‘naya mashina) in the kitchen – кухня (kukhnya). It is the kitchen that is the nerve center of the Soviet apartment, where the stories, joys, and sorrows of life unfold and unraveled, where people discuss life for hours – часами (chasami), and are drinking tea at any hour. Some green plants decorate the windowsills – подоконник (podokonnik), the house cat sometimes squatting nearby. Central heating – центральное отопление (tsentral‘noye otopleniye) that cannot be set overheats the air so that the small ventilation window fitted in the corner of the main window – форточка (fortochka) must be left open. 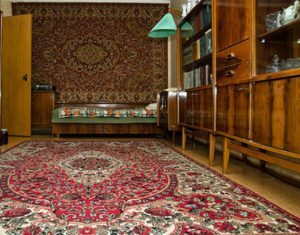 The Soviet apartment has a special place in the Russian imagination, and its mere mention refers to an entire universe, familiar and common to all. It played a real role in the lives of Russians and even on cinema screens, as in the film The Irony of Fate – Ирония судьбы (Ironiya Sud’by) where the slightly drunk Moscow hero finds himself in St. Petersburg but does not realize it, because the same street, the same building, and a completely identical – идентичный (identichnyy) Soviet apartment exists in both cities. The Soviet apartment is a character in itself. Rest assured, even if you cannot find the solution to the puzzle, this quest has given you an experience with the past-прошлое (proshloe), common to so many Russians.